Project Development Consultant – Water, Johnson Controls, Inc. Projects that improve wastewater treatment infrastructure can increase operating efficiency, help the local environment, provide economic benefits, improve the reliability of compliance, and enhance the community's quality of life. Cities and water authorities can attain these benefits without investing their own capital up front and yet earn immediate long-term guaranteed cost savings. It's accepted wisdom that investments in roads, bridges, communications, and power supplies help communities prosper and grow. 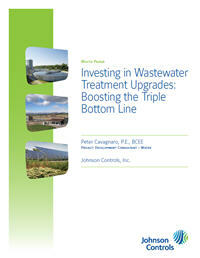 That is equally true for investments in wastewater treatment. In fact, modern and efficient plants help communities boost the "triple bottom line" of economic prosperity, environmental quality, and social benefit. While it may seem counterintuitive in a time of economic duress, now is an excellent time to pursue wastewater treatment plant improvements. Upgrades can increase treatment efficiency, allowing the community to accommodate industrial growth without the high cost of plant expansion.